New Zealand is famous for its clean, green and natural environment. The country was first named Aotearoa (The Land of the Long White Cloud) by Maori and has a population of approximately 4.7 million. The North and South Islands and Stewart Island together cover an area about the size of Britain. Within New Zealand you can experience towering snow covered peaks, rolling green hills, breathtaking glaciers, deep fiords, crystal clear lakes, rain forests, geothermal areas and golden as well as black-sand beaches. Here we will provide links to many of these tourism and travel sites on the web but this page is really dedicated to those out-of-the-way places that are possibly missed by the average tourist. This page will continue to be a work in progress and your input is appreciated. Crystal Mountain - December - On one of the nicest days of the Spring ... as a matter of fact, the first really nice day, along with a couple of friends we drove over to Crystal Mountain in Swanson, Waitakere. This Gallery, Crystal Mine Museum, cafe, and theme park is located only 20 kilometres from down town Auckland. The first order of the day was a cup of coffee and a bite of brunch at the cafe. After that we browsed through the Gallery and marvelled at the selection of gifts and souvenirs made from semi-precious stones, crystals and other minerals. Crystal Mountain also offers a Crystal Mine Museum, function centre, animal park and a children's play park. It is a surprising little gem located not far from Auckland. On the way home we made the 'required' stop at a winery located on the Waikoukou Valley Road near Waimauku. There we tasted a couple of their new whites and settled on a fruity sauvignon blanc to enjoy at a table in the garden area. What a great day we enjoyed and all of this just short drive from home. The scenic road over Haast Pass, the southern gateway to the West Coast, is one of the most stunning in the country. Make sure you stop at any of the short walks that are well sign-posted along this route. One of the best of them is just north of Makarora, located within the World Heritage listed Mount Aspiring National Park. This is the Blue Pools Walk, which has become world-renowned as a must-see highlight in this wilderness region. It features a carefully maintained gravel path and boardwalks that wind through a native silver beech forest and lead to a swing bridge strung high above the Makarora River. The views back to the mountains of the Main Divide are absolutely breath-taking. Forty minutes north of Auckland on Highway One, just before entering the town of Warkworth, The Honey Centre and the Honey Cafe provide a pleasant stopover on your way north. The Honey Cafe is open 7 days a week from 8:30am to 4:30pm and they serve all kinds of fresh baked cafe food and honey ice creams. They serve an all-day breakfast that is very generous. Mrs Wilderness experimented with having honey on her cappuccino and found it quite tasty on an already great tasting coffee that we have always experienced there. Next to the cafe one will find the largest bee display in New Zealand. Also the Honey Centre store carries a huge variety of bee products, beekeeping supplies, gifts and souvenirs. On our last visit I found an Apricot Brandy Honey that is just great! Some friends of ours, Frank and Joy, recently spent some time in Wellington visiting family. On an extra-special side trip, they spent a couple of days in Martinborough, which isn't that far away from New Zealand's Capital city. Martinborough is a rather unique place to visit any time of the year, particularly if you are hungry and most especially if you enjoy fine wine. Here you will experience a rural township with fabulous people and great sites, surrounded by the luscious farmland, vineyards and mountain ranges. Our intrepid travellers came back singing the praises of region's famous Pinot Noir wine and many fine eating establishments. They were particularly impressed with the La Mousse Restaurant, which has a large courtyard for outdoor dining, bar, restaurant and function room. There was a time when the campground was full of trees that provided shade and wind protection for campers. Of course this couldn't be left alone because a strong wind may blow a tree down and smash a caravan or two. As a result, the trees were ordered cut down and the last time we were there it looked like a war zone. Never the less, there is a fine beach not far from the campground and like I said, clothing is optional (at least it was). It might be a good idea to check further before walking around in your birthday suit. If you drive down towards the camp from the highway during the holiday season (from December to late January) there is a gatekeeper in attendance at the camp and you can't enter the grounds unless you are staying there. In this case, drive around to your left, before you go into the camp, and follow the track. This will take you to a secluded parking area where you can leave your vehicle and walk up onto the beach - only a minute or two's walk. A while back we drove out to MacNuts Farms near Helensville for morning coffee. Yes, it was quite a drive for coffee but we wanted to do some exploring as well. MacNuts Farms is a macadamia nut orchard, processing facility and a very nice cafe all rolled into one. Visitors are free to walk around the property to take in the picturesque lakes, orchards and flowers. During the week and in season, visitors can view the picking, cracking and preparation of the macadamia products. Although we did not make arrangements, pre-booked tours are available for groups. There are self-guided tour sheets available on request in case you want to do your own thing. The MacNuts Cafe served really good coffee along with food to order specializing in macadamia-based goodies. Being a chocoholic, I couldn't pass up the chocolate covered macadamia nuts. From Auckland, take the North-western Motorway towards Helensville. Just before Helensville (about 1 kilometre) turn left at the roundabout and head toward Parakai. About 11 kilometres (6.8 Mi) out this road you will find the farm. Cafe Hours: Wednesday to Sunday and public holidays, 10am to 4pm. Orchard and Retail Shop Hours: 7 days a week, 10am to 4pm. For a great day-trip out of Auckland we can highly recommend the Art of Cheese Cafe. Whether for a nice relaxing lunch with a glass of wine or for afternoon tea, the Art of Cheese is a great place to visit. The cafe and factory are Located in the Puhoi Valley between Orewa and Warkworth, about an hour north of Auckland on Highway 1. It would be hard to find a better place to learn about the making of cheese while enjoying yourself at the same time. Been There? Then say it! Now here's something to try after you have visited the great wine producing areas of the Hawke's Bay. Of course try some world-renowned sauvignon blanc, drop in at Napier and Hastings but then head south through Waipukurau. If you get on Hwy 52 and continue south, somewhere between Porangahau and Wimbledon you will run into a town with a very strange name' very strange indeed. The town's name has eighty-five letters which takes the world's record (that we know of) for long place names. Here it is but if there is a typo in there somewhere don't blame me, I'm not doing it over! You've got to stop there, or at least go through town and then send a post card to relatives and friends telling them of your experience. Naturally, you will have to buy 'big' post cards. I cannot translate much of anything in the wonderful Maori language let alone this word but I have found a couple of references that claim the following is the meaning:. "The place where Tamatea, the man with the big knees who slid climbed and swallowed mountains, known as land eater played his flute to his loved one." Just being able to say you have been there must be worth the drive. Waiheke Island is a taonga (treasure) with many special places. 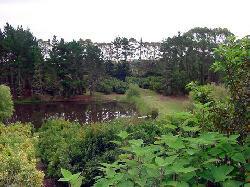 The walks on Waiheke Island provide the perfect way to get close to nature and discover the beauty of the island. Try the three-hour loop from the old wharf at Matiatia through the Matietie Historic Reserve around the waterfront to Cable Bay. Continue on the track around to Owhanake Bay then onto Oneroa Bay before looping back to Matiatia wharf. Suitable for novices, the walk also takes in World War II pillboxes and terraces of an ancient headland pa. If you feel like a fancy lunch, then take a detour to Mudbrick Cafe on nearby Church Bay Rd. Cost: Free if you pack a picnic. DK from West Harbour recommends Hot Water Beach for a real Kiwi experience. He tells how two visitors from Germany arrived at the house, un-packed and wanted to leave immediately for this (famous - in Germany) attraction. The hot mineral pools are left over from the Coromandel Peninsula's geothermal past. Between about two hours each side of low tide visitors can dig a hot spa of their own in the sand. One can sit in their newly formed spa pool just a few feet away from the Pacific Ocean breaking on the beach. Be sure to take a shovel (the bigger the better) when you visit so you can dig your spa to a decent depth. When Mrs Wilderness and I went there we had been attending a friend's wedding and were totally un-prepared. We did see quite a good number of people enjoying the day. Hot water beach is located on the Coromandel Peninsula just south of Whitianga. From Thames, drive south to hwy 25 near Kopu and head east and north up the peninsula, driving through some of the most beautiful scenery in New Zealand. Mrs Wilderness and I stayed at The Church in Hahei, which is also near Whitianga and we can recommend it highly. The Church offers a very nice restaurant with cottages for accommodation. Check this web-site for Tide Times and other information. Mrs W and I haven't been there in years (I mean years) but sure would like to visit again. Two favorite South Island spots are Akaroa and Arrowtown. Akaroa on the Banks Peninsula is just a short drive from Christchurch and Arrowtown a short drive from Queenstown. Both places have wonderful B&B's and Akaroa is famous for their French restaurant, C'est La Vie which was written up in the NY Times in 2005!